1 plays dummy defense on offense 1. He lets 1 beat him and yells out HELP! As Offense passes Defense he looks to drive to the basket. Meanwhile Defense on the left line will star to run towards the basket. 2 defense should yell out, "Help Coming!" or something of that nature. 2 will position himself ready to take the charge. 2 should position him appropriately and fall down using proper charging techniques. Make sure he isn't wobbling when he positions himself. Offensive player takes a jump shot over the Defender. The person who was second in line plays Dummy defense. The offensive player lines up in the back of the defense line. The defender who went to take the charge lines up in the back of the offensive line. The Key to this drill is to have the defenders yell, "Help! ", "I got your back!" Also always to box out the shooter. The offense should also run full speed. It should help the offensive player control his balance. 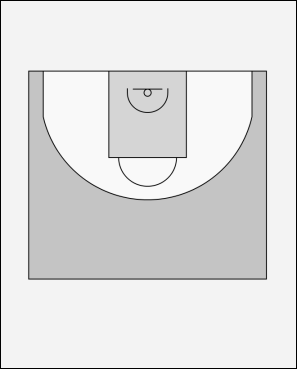 He practices avoiding the charge with an effective short-range jumper. Drill submitted by: Phil F.